Sign up for Broadjam today to follow Pablo's Problem, and be notified when they upload new stuff or update their news! This powerhouse quartet from Buffalo, New York, set out to twist the h?eads of the prog world with their special blend of rock and jazz, all spiced up with a heavy wallop of all out improvisation. Think of King Crimson, Henry Cow or Peter Murphy. 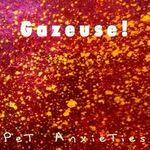 The Pet Anxieties CD features almost 70 minutes of their unbridled aural antics. Pet Anxieties was performed live, and recorded directly to two track at the SUNY at Fredonia Recording Studios by Dan Berggren and Dave Kerzner.